What this audiobook suggests is simple: to SIMPLIFY by getting rid of things first rather than continually building on what doesn't work; a form of spring cleaning for your organization. 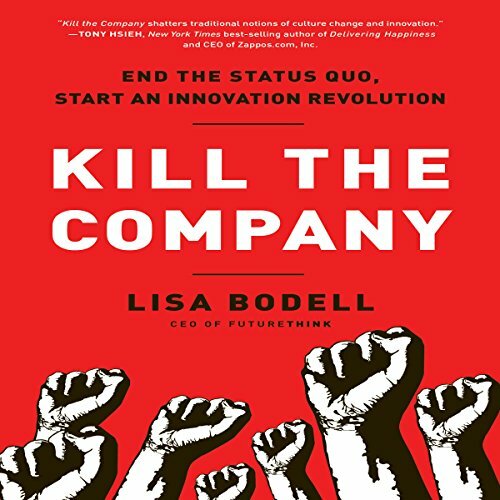 Innovation specialist Lisa Bodell urges companies to question assumptions and to challenge rules that have outlived their time. Killing these status quo attitudes makes space for change and more value-added work, like thinking. Bodell tells us that these changes need not be one-size-fits-all initiatives that are forced upon employees. Instead, we need to embrace smaller, positive behavioral changes that create ripple effects throughout the organization. Too many change initiatives simply add another layer of processes to the to-do lists of already overwhelmed and tired employees. Not this one. Innovation is supposed to make things better, not worse, easier, not more complicated. Kill the Company is your guide for simplifying and streamlining, then building and maintaining a place where everyone's innovative spirit and energy fuel the long-term goals of your organization. A company that empowers its people to think critically, question relentlessly, and act boldly, to move from Zombies, Inc. to Think, Inc., will own the future. View More In Structural Adjustment. If you have any questions about this product by Bibliomotion, Inc, contact us by completing and submitting the form below. If you are looking for a specif part number, please include it with your message.